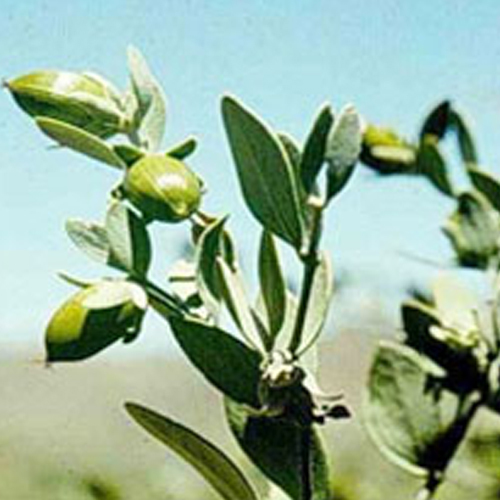 Unrefined Jojoba Oil is hygienically produced from the seeds of Jojoba plant by employing cold pressing method. This oil is ideally utilized in various cosmetic and pharmaceutical products due to its high nutritive and medicinal value. It comprises of various ingredients and chemical components like arachidic, behenic, lauric, palmitic, margaric, stearic, oleic, myristic, palmitoleic, eicosanic and lignoceric. The oil also contains some essential fatty acids in it such as palmitic acid, erucic acid, eicosanic acid, oleic acid and linoleic acid. The golden unrefined jojoba oil is extracted using cold press method from the seeds of jojoba plant. It is supremely blended with its medicinal and nutritive value, which make it highly preferable for curing distinguished skin and hair related disorders. The efficacy of this oil improves with its exceptional properties like anti-bacterial, non-toxic, anti-inflammatory, non-comedogenic and optimum moisturizing. Due to its outstanding properties, this oil is highly demanded in formulating different medicinal and cosmetic products. Owing to its excellent moisturizing characteristics, the oil is used in different cosmetic skin care and hair care products. This oil leaves the skin moisturized, smooth and soft with its exceptional moisturizing properties. The oil is highly effective in different conditions such as psoriasis, eczema, arthritis, rheumatism, inflammation and rosacea. This oil is also used for healing cold sores, sunburns, warts, cuts and wounds. Our oil is also a good remedy for acne due to its anti-septic and anti-greasy properties. It also reduces stretch marks, wrinkles and cellulite. With its moisturizing, nourishing and healing properties, the oil is ideal for massage and aromatherapy. Anti-bacterial and anti-allergenic nature of our oil gives excellent aroma therapeutic results to the body, soul and mind. Jojoba Oil Unrefined is cold pressed oil extracted from the finest grade seeds of Jojoba plant. Due to its matchless composition and premium properties like moisturizing, anti-bacterial and various others, the oil is ideal for skin care and hair care.